AIATSL Notification is out. AIATSL is recruiting for 154 Junior Executive (Technical) And Customer Agent Govt Job Posts. You can check AIATSL - Air India Air Transport Services Limited last date, download AIATSL notification, visit AIATSL official website and check other AIATSL Vacancy details.Complete Vacancy and recruitment Details about 154 Junior Executive (Technical) And Customer Agent Govt Job vacancies in AIATSL are provided below by JobSarkari.Com only for you. Date of Interview. 17/02/2019 to 18/02/2019. Mode of Payment. Candidate Can Pay Through Demand Draft in Favour of AIR INDIA AIR TRANSPORT SERVICES LTD, payable at Mumbai. Jr.Executive (Technical) Candidate Must Have Passed Bachelor of Engineering in Mechanical / Automobile / Production / Electrical / Electrical and Electronics / Electronics and Communication Engineering And Must be in Possession of LMV Heavy Motor Vehicle Valid Driving Licence to be Produced Maximum within 12 Months. 17/02/2019. 04. Customer Agent Candidate Must Have Passed Graduate and Well Conversant with Computer Operation. IATA-DGR or IATA-CARGO,experience in any Airport in any of the Areas or Combination Thereof, of Fares, Reservation,Ticketing, Computerized Passenger Check-in/Cargo Handling Area with any Airline or Ground Handling Agency. 18/02/2019. 150. Total No. of Post 154. For General Category. 28 Years. For OBC Category. 31 Years. For SC/ ST Category. 33 Years. 4. Candidate Can Go on Given Address on 17th February 2019 to 18th February 2019. Q. 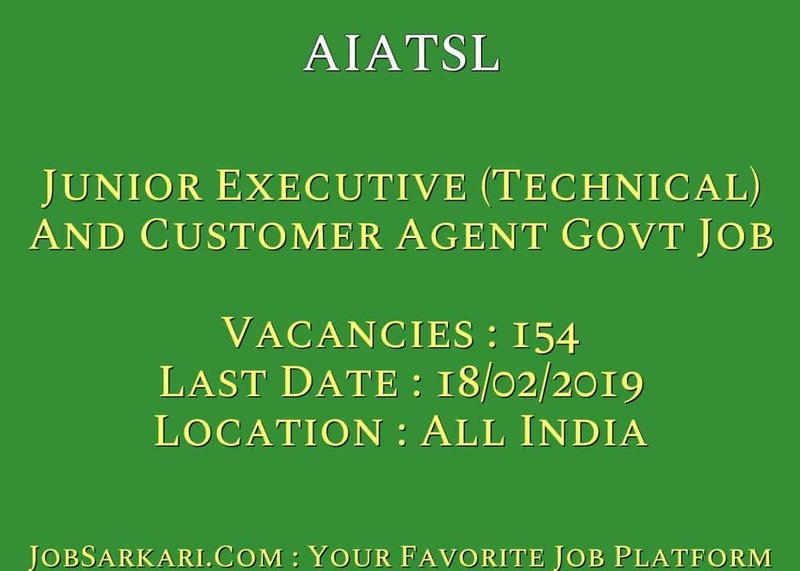 What is the Last Date For AIATSL Junior Executive (Technical) And Customer Agent Govt Job Vacancy ? A. 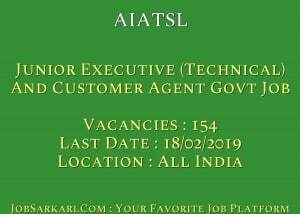 Last Date for AIATSL Junior Executive (Technical) And Customer Agent Govt Job Posts is 18/02/2019. Q. What is the Form Type of AIATSL Junior Executive (Technical) And Customer Agent Govt Job Recruitment ? A. The Form Type for AIATSL Junior Executive (Technical) And Customer Agent Govt Job Posts is Offline. Q. How many vacancies are available in Air India Air Transport Services Limited Junior Executive (Technical) And Customer Agent Govt Job Posts ? A. There are about 154 Vacancies in Air India Air Transport Services Limited Junior Executive (Technical) And Customer Agent Govt Job Posts. Aap is Post ke Liye Apply kr Sakte Hai..